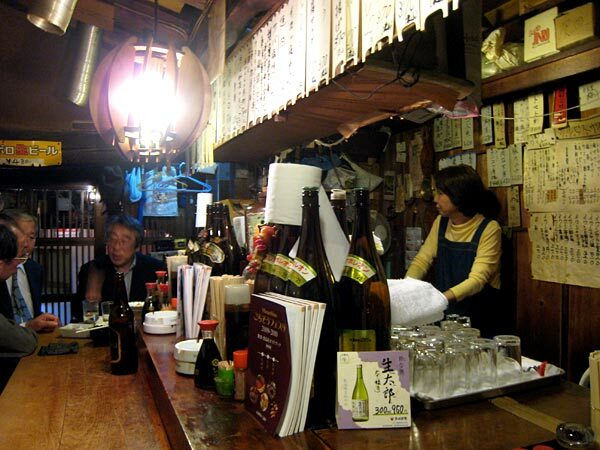 A typical izakaya bar in Harmonica Yokocho on the crossroads of Harmonica alley and Noren passage. 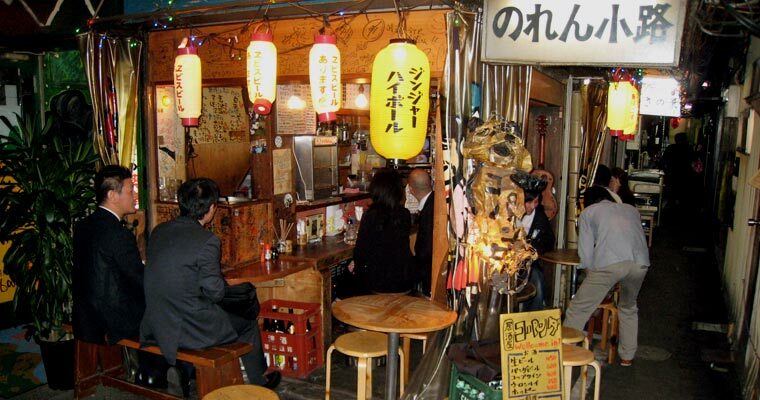 "Harmonica Yokocho" is a small stretch of tiny shops, eateries and bars located to the north of Kichijoji station. While Kichijoji as a whole is seen as a fancy area where numbers of pop musicians, manga creators, actors and artists reside, Harmonica Yokocho is old-fashioned and awfully crowded and creates the atmosphere common with Asian bazaars. The name "Harmonica Yokocho" was given to this area by a writer and critic, because he thought that rows of small shops reminded us of harmonica holes. Harmonica Yokocho is indeed the remains of a post-war black market. 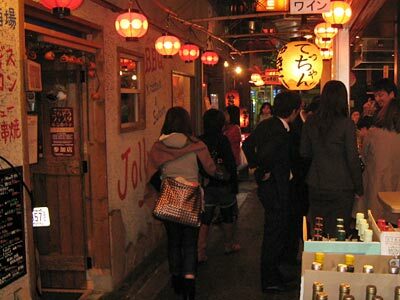 Though very few among some 90 shops and eateries continue to exist from the earliest period of Harmonica Yokocho, the atmosphere made of narrow alleys and passages reminds us of the old days. Some shops and bars look really very old and trendy eateries are also well integrated into their traditional surroundings. I often looked into the narrow alleys when I came to Kichijoji and became anxious to visit Harmonica Yokocho in the evening and sit on a chair in one of the bars to drink and cost tidbits and enjoy the environment. Then, recently I carried out my long standing idea. I had checked the relevant information on internet and picked up several izakaya bars before I went to Harmonica Yokocho. However, some bars were so popular that they were overcrowded and I had to give up sitting there. 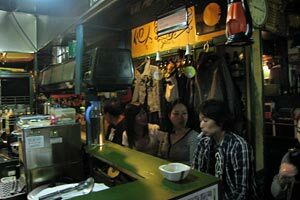 One of those popular bars was Tecchan, which was filled up with young guests. I therefore turned round and entered Mifune on the opposite side of the same passage. A small number of old guests were sitting at the counter of Mifune. Tecchan was filled with young people. Those who could not enter the house were drinking in the passage. Quite in contrary to Tecchan, only four old gents were sitting at the counter and an old and quiet woman was serving in Mifune. This fitted into my image of Harmonica Yokocho. Though the bar was small and the number of chairs was only about ten, there were numerous menus. Most of them were very traditional and I ordered radish braised with soy-sauce and grilled mackerel together with sake. They were prepared in a separate kitchen and had authentic traditional taste. I noticed a small sheet of menu paper hanging on a wooden wall: "deep fried kangaroo"! Though I did not try it, I appreciated that this old bar had courage to try something unusual. When I left Mifune, Tecchan was still crowded and I decided to try another bar. Dengaku-yama existed on the first floor on top of very steep stairs. 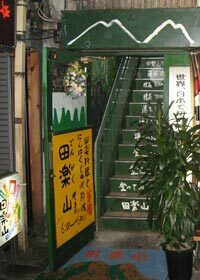 "Yama" means mountain in Japanese language and the owner of Dengaku-yama compared the stairs with a mountain climbing route. An old man wearing a team cap of a professional baseball team Hiroshima Toyo Carp was sitting on top of the stairs and beckoned guests to come in. Dengaku is vegetable or meat grilled in skewer with special miso(**) sauce. Dengakuyama has many kinds of homemade sauce. I ordered eggplant dengaku, a typical dengaku menu, and pork kakuni(***) with shochu(****). 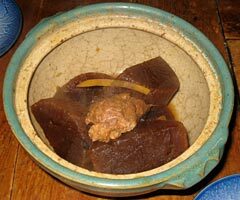 Miso is fermented soy-bean paste. It is used for miso soup and many other kinds of food in Japan. Kakuni is sweet flavored braised pork. Shochu is Japanese style distilled alcohol. It is usually made from sweet potato, barley, buckwheat or rice, and the proof is usually 25%. Frankly speaking I was not much convinced by their tidbits, because they all used some sorts of ready-made ingredients. Their guests were mostly young and obviously their menus targeted inexperienced younger generation. When I come to Harmonika Yokocho next time, I want to try other bars. There are not only Japanese but also some European style bars which offer wine and Western style tidbits. Anyhow, I appreciate the atmosphere of Harmonica Yokocho where I can relax myself. The newly developed sites in Tokyo such as Roppongi Hills, Sio-site and Tokyo Midtown have all very colossal and artificial spaces and their sophisticated shops offer internationally first class goods and services, because they were developed and managed by big capitals. However, this has another side of the coin; they lack human touch, individuality and personal relationship. These characteristics are exactly what I can find in Harmonica Yokocho.